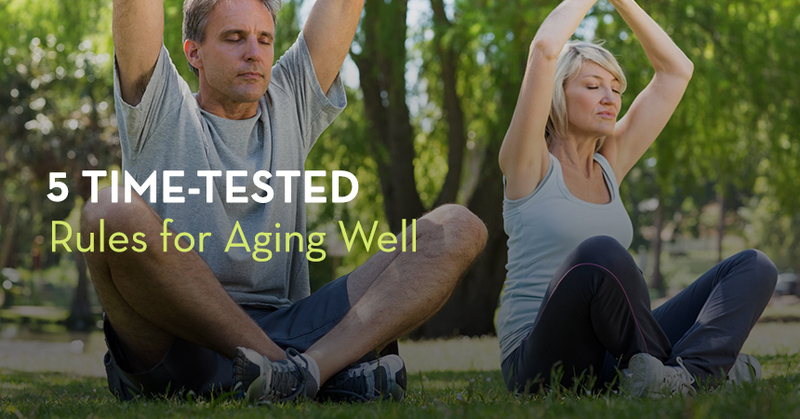 Aging well doesn’t mean achieving an impossible standard for appearance and health. You can follow science-backed, time-tested “rules” for investing in your health over the long run. Here are five to support long-term physical and mental wellness. Your body needs fewer calories as you age. Your metabolism slows down and your energy needs fall as you become less active. Men start requiring fewer calories in their late 30s, while women do the same in their early 30s. If you are extremely active, you may not need to reduce your calories until your 50s or 60s. When you do begin to eat less, pay attention to what you eat. Your body loses its ability to absorb nutrients as well as it did when you were younger. That means that as you age, it becomes even more important to get enough vegetables, lean protein and whole grains. You don't have to exercise for long periods of time. Dividing your activity into 10 or 15 minute increments is beneficial. Exercise has been linked to a variety of long term health benefits. Both aerobic (e.g., brisk walking) and anaerobic (e.g., weight lifting) exercises have been tied to reduced risk of stroke, diabetes, cancer, depression and other ailments. Even if you are sedentary today, you can see the benefits of adding just a little activity, including decreased risk of disease. Your activity needs stay the same from age 18 to about age 64. During that time, the World Health Organization recommends all adults get 2.5 hours of moderate aerobic exercise per week. You don’t have to exercise for long periods of time. Dividing your activity into 10 or 15 minute increments is beneficial, but it’s good practice to check with your doctor before starting any exercise program. Social relationships can improve your mental and physical health. In fact, having good quality and quantity of friends has even been shown to improve how long we live. Socially connected adults have better behaviors, psychological traits and fewer health costs, for instance. Having good quality and quantity of friends has been shown to improve how long we live. People who maintain only a small social network or isolate themselves from social situations actually degrade their quality of life. They tend to have higher rates of infection, depression and substance abuse. There may even be a correlation between socializing and disease prediction among the elderly. Skin cancer is one of the most preventable types of cancer, because it is often caused by lifestyle as opposed to genetics. Apply a sunscreen of at least 30 SPF to exposed skin (including your face) whenever you’ll spend time outside, even if it’s cloudy. Choose a broad-spectrum product that protects against both UVA and UVB rays. If you’re going to be outside for a long period of time, re-apply sunscreen every two hours or after toweling off from water. Wear a wide-brimmed hat and sunglasses when possible. Following these tips – even during cold times of the year – will help protect both the health and appearance of your skin as you age. Giving back doesn’t just make you feel good. Researchers have learned that volunteering leads to better health. Among all volunteers, older people tend to get the greatest mental and physical boosts from it. Even more interesting is that receiving charity didn’t have any correlation with an adult’s health, but the actual act of giving did. As of the time of publication, Sarah Alban is a freelance writer and Dr. Aoki is an employee of Kaneka North America LLC, a manufacturer of CoQ10 ingredients.